His name means Struggle, and despite turning 101 in January, Zabalaza Mshengu is still struggling to get government to process his legal claim to the land where he hopes to live out the time he has left. 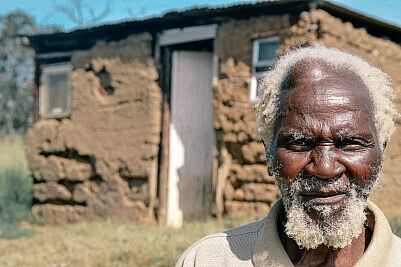 Mshengu had reason to hope in 1996 when a new law promised to secure his rights to the land he had grown up on. The Land Reform (Labour Tenants) Act derives from the Constitution, which guarantees tenure to people deprived of it in terms of racially discriminatory laws (see a timeline on labour tenancy in South Africa). The act addressed the plight of labour tenants who, like Mshengu, had clung to land and the remnants of independent farming by working for land owners without receiving wages despite attempts by successive apartheid laws to destroy this way of life. It provided for labour tenants to claim ownership of the land they and their fathers had lived on and used. By the closing date for the lodging of claims in March 2001, about 19,000 labour tenants had applied for land ownership. Mshengu was one of them. Cowling’s conclusion was once again confirmed last week when the Department failed to provide the information the Court required. Once again, the Department failed to show the courtesy of informing the Court or the applicants that it was unable to comply with its orders. And once again, the applicants’ lawyers have had to request that either the information is provided or that the Department is found to be in contempt of Court. It has until Friday to respond. Donna Hornby is a post-doctoral fellow at PLAAS, UWC, whose research focusses on the social and production dynamics affecting farm dwellers and former labour tenants in KwaZulu-Natal. She does part-time research and advocacy work for a land rights NGO, AFRA, where she has worked in various capacities for nearly 20 years, as well as part-time research work for CLS on issues relating to customary tenure on land in KwaZulu-Natal.